The French engraver, Albert Decaris, began his illustrious career in 1935. When I first started looking into the engravings of Decaris I had assumed that the first stamp issued with his name on it was the first stamp he engraved. This turned out not to be the case. 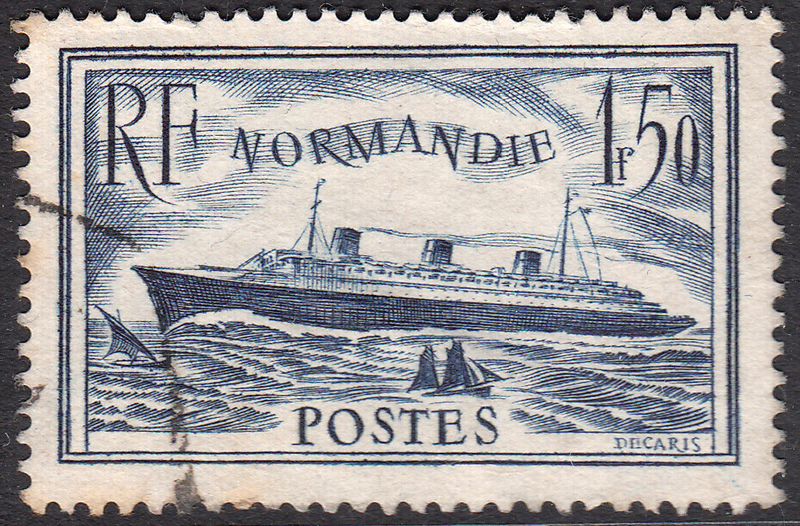 In this blog I shall take a look at the first Decaris engraved stamp ever issued - a stamp commemorating the maiden voyage of S.S. Normandie. In case you are interested the first stamp Decaris engraved was the Cloister of the Church of St. Trophinus, which I will look at in a future blog. 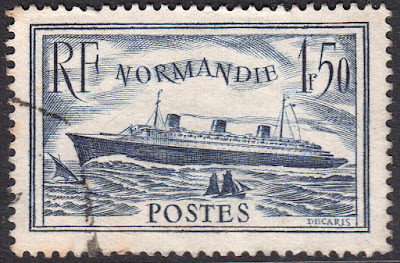 The S.S. Normandie commemorative stamp was issued 23 April 1935. I have discussed the design and quality of this stamp with several different people and the feelings have been mixed. Some like it and some downright loathe it. I, for one, rather like it. It was only the second stamp Decaris produced so he hadn't fully developed his style yet, but you can already see in the stamp quite an engraving talent emerging. What do you think...? Now let's have a close look at the subject of this great (imho) stamp. Normandie was a French passenger liner, built in Saint-Nazaire for the French line: Compagnie Generale Transatlantique. Her hull was laid on 26 January 1931 and her maiden voyage was four years later on 29 May 1935. Incidently, I have used here the feminine 'she' to describe the ship, but in France ships were described in the masculine 'he'. S.S. Normandie was a radical ship, utilizing many new design innovations. One such innovation was her bulbous forefoot beneath the waterline, which, combined with a slim hydrodynamic hull, enabled her to achieve faster speeds than earlier ships. She also had new style turbo electric engines, which was far more efficient than earlier propulsion systems. Coupled together these innovations enabled Normamdie to hold the Blue Riband for the fastest transatlantic crossing on many occasions during her career. In doing research on this amazing ship I was blown away by its lavish interiors. I could probably go on and on with details, but I don't want to bore you. Instead I'll mention a few of the most staggering details. Firstly, a new design feature whereby the funnel intakes were redirected down the sides of the ship instead of straight up the middle gave interior designers far more room to work with. This extra room was utilized to stunning effect! The ship's First Class dining hall was the largest afloat. It was 305 feet (93m) in length, 46 feet (14m) wide, and a staggering 28 feet (8.5m) high. If that in and of itself isn't grand enough for you, well imagine yourself in your finest garb strolling through entry doors that are 20 feet tall! 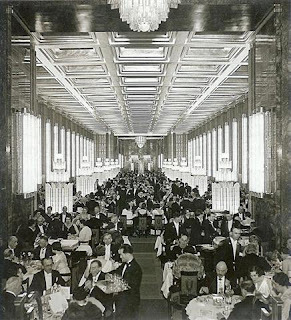 Then you enter a room sumptuously decorated in Art Deco style with glass ceilings ornate columns and huge chandeliers that earned Normandie the nickname 'ship of light'. One more little tidbit I'll add - purely because I am an ancient Egyptian history buff - is the decor of the first class smoking room, which was decorated with large murals depicting ancient Egyptian life. Sadly, this grand lady of the oceans met with a fate unbecoming her regal stature. At the outbreak of World War II Normandie was docked in New York. And there she remained until after the attack on Pearl Harbor in 1941. The French crew was removed and the ship was prepared for conversion into a troop ship to contribute to the war effort. Normandie was renamed USS Lafayette in honour of the French general who fought for the colony in the Revolutionary War. Now to the tragic bit. While being outfitted a fire broke out aboard ship, since the fire-watch systems had been deactivated for the conversion. This proved to be just the beginning of a dark comedy of errors! When fire fighters arrived they found to their horror that the US hose fittings weren't compatible with those on the French ship. While manually pumping water on the blaze using fire ships the vessel developed a dangerous list to port as a result of water flooding the ship. The designer of the ship arrived on the scene to help, but he wasn't allowed to participate. He suggested that the firefighters open the seacocks, which would flood the lower decks causing her to sink the few feet the harbour floor. This would have stabilized the ship. But his suggestion was ignored! As a result the ship listed further and further until at 2.45 am on 10 February USS Lafayette capsized. 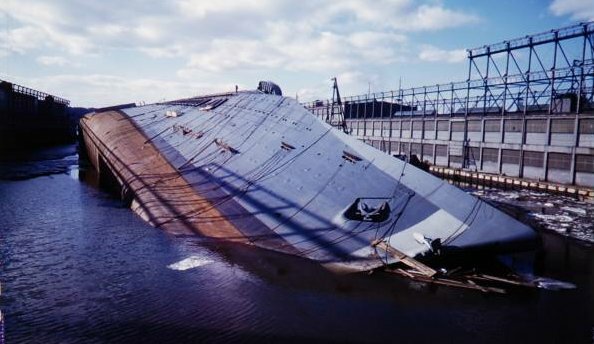 Once she was salvaged she was reclassified as an aircraft and transport ferry, but the damage from the accident was too extensive and she sat in dry dock till the end of of the war. Finally, at the end of the war, on 11 October 1945 USS Lafayette was stricken from the naval register and scrapped. Such a terrible end for a ship once nicknamed 'ship of light'.